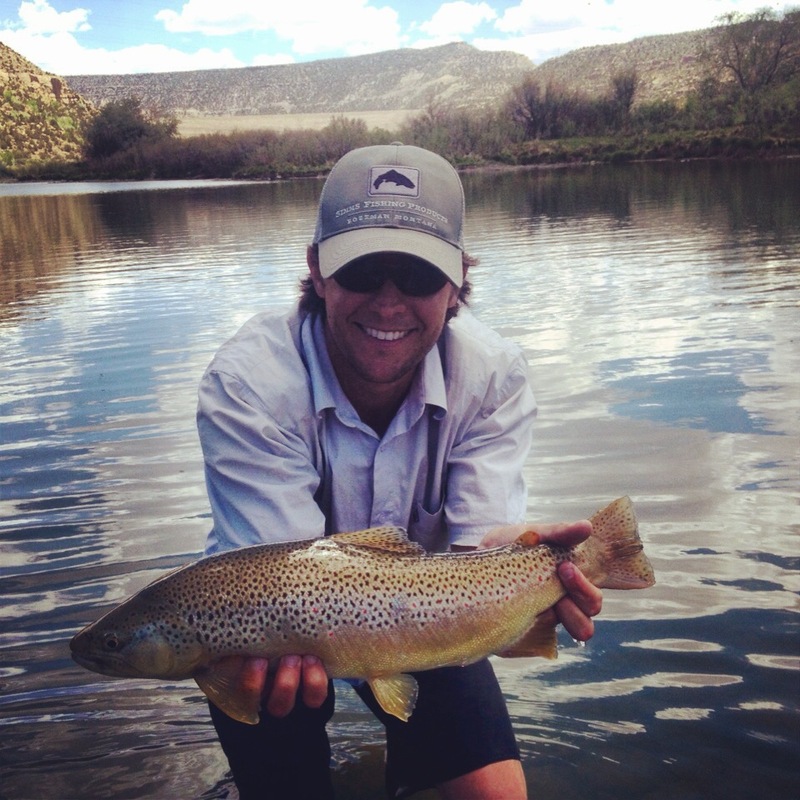 San Juan River Fly Fishing: it’s a daily topic here at Duranglers. This isn’t a complaint either, it’s just a fact. Talking about the San Juan is what has kept Duranglers around for 30+ years. Keeping our finger on the pulse of one of the nation’s greatest tailwaters is almost as important to us as putting out the ‘Open’ sign in the front window every morning. Now if you have never heard of the San Juan River or why you would want to fly fish it, I suggest you check this out first before continuing on. Safe to say, it’s a place you should fish at least once in your life. Because this is a beginners guide, I am going to try and keep everything as simple as I possibly can. Simplicity is a great asset on the San Juan, one that many people don’t consider. Keeping it simple will quicken the learning process. Above are some quick link buttons that will take you to our current San Juan River Reports, flow info, guide info, fishing licences, and a map (or just scroll down for the map). These will help you catch fish (and not get arrested) on the San Juan River. 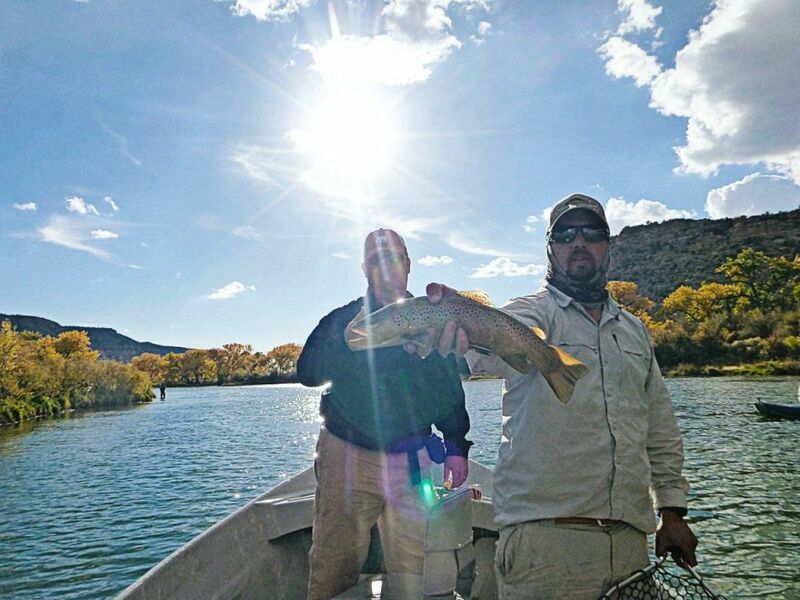 Before we get into it, let me just state that if you really want to up your San Juan River game, take a trip with one of our experienced guides. A guided day on the San Juan will drastically reduce your learning curve and make sure you are getting into fish a lot sooner. Our guides spend hundreds of days on the San Juan each year and the knowledge gained through years of rowing clients down the river will be imparted onto you throughout the day! Where is the San Juan River? Northern New Mexico. A 60 minute drive from Durango! What makes the San Juan so special? 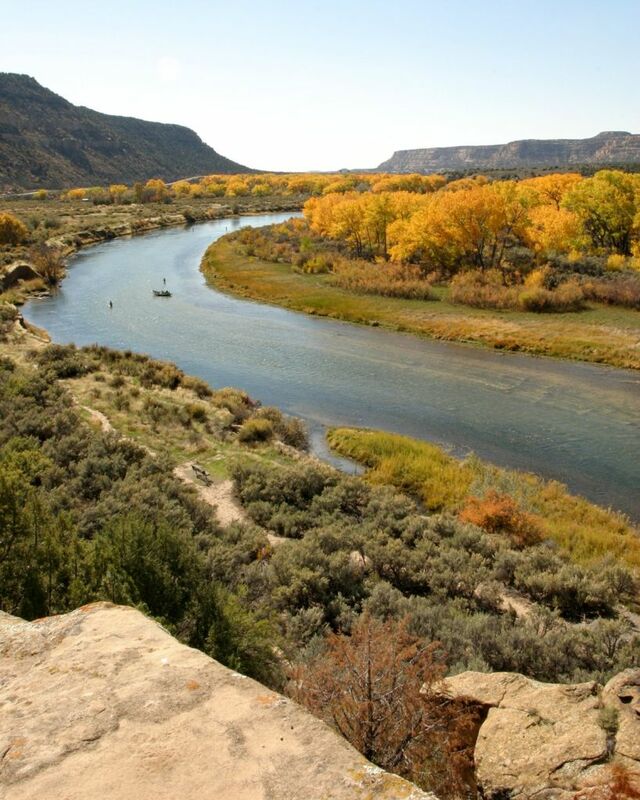 The San Juan River in New Mexico is a tailwater flowing out of Navajo Dam from the bottom of Navajo Reservoir. This makes for a fairly consistent year round outflow temperature. 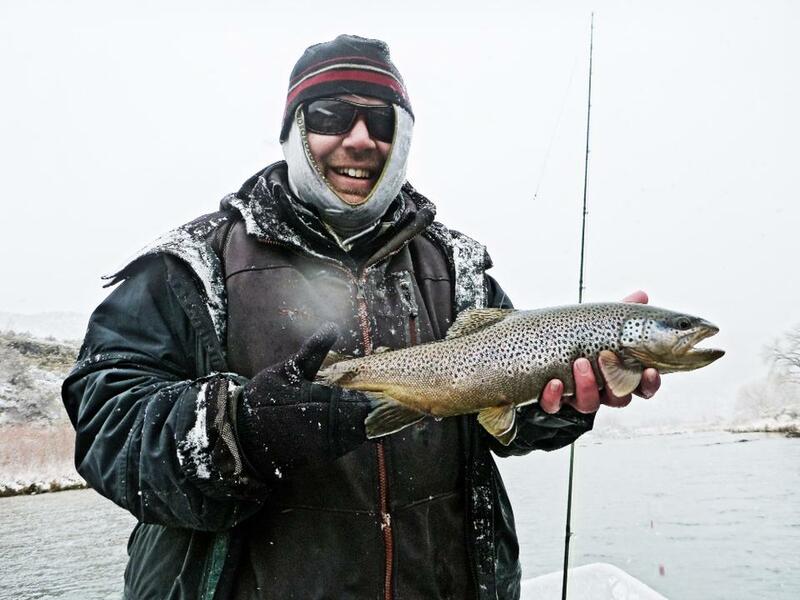 Consistent year round water temps make for year round fishing. The magic of tailwaters! When the river was impounded in 1962, the water temperature mixed with the nutrients in the river made the perfect storm that resulted in a bug factory. Trout were stocked and immediately began to thrive. With nonstop food, trout eat constantly…and grow large. This section is low-gradient and easily floatable year round. Add to that, the beautiful desert canyon scenery, and it becomes a very unique fly fishing experience. The state of New Mexico realized this and the first three miles of the tailwater are a part of Navajo State Park and incorporate special catch and release fly and lure only regulations. To put it simply, it is like a large spring creek fishery in the desert. 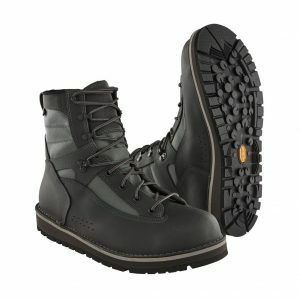 Waders and Boots- You want waterproof, breathable waders…and you don’t want leaks. Even in the dead heat of summer, the river is cold. Leaky waders can make a good day go bad real quick when you have to get out of the water every five minutes to warm up. While the San Juan this isn’t the most technical wading ever; the bottom of the river is covered in slick snot-like moss. Stepping on a slick rock is a quick way to take a dunk. Good boots are a must and cleats or aluminum bars help immensely. Our guides are on the San Juan a lot, and because of this often choose Simms Bootfoot Waders as they are quick to get on and immensely warmer. Clothing – With the cold water, you will want to wear warm layers on your lower half at all times. Wicking layers and warm merino wool socks will keep your lower half happy in all four seasons. Avoid cotton. If it is the winter, dress your upper half appropriately in layers and always be prepared for rain or snow with a waterproof rain shell. 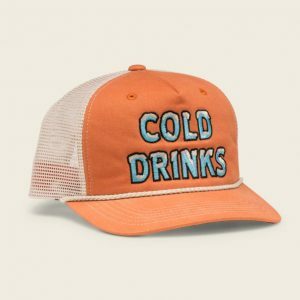 During the dog days of summer; cool long sleeve shirts, caps, and Buffs will help keep your skin un-burnt. It’s an interesting experience to have the top half of your body sweating in the summer heat and the bottom half of your body needing an extra layer while wading in the cold water. Fly Rods – Since this a trout fishery, 4 to 6 weight rods are standard. The best all around fly rod is a 9 foot 5 weight. We like to fish longer rods up to 10 feet to assist with nymphing, but it is not necessary. Our favorite rod for the San Juan is a 9′ 6″ 5 weight Scott Radian. Fly Reels – A reel matched to your rod and line weight with a solid drag is important. Since you will be fishing light tippet, a solid drag is key to keep you from breaking off any bigger fish. Our favorite reels include the Ross Reels Animas and the Sage Spectrum LT. Leaders – More often than not, you will use a 7.5′ or 9′ 5x leader. Rio Powerflex Plus leaders are often our choice. Tippet – Tippet is actually pretty important for San Juan River fly fishing. The trout have become accustomed to the presence of fisherman on the river…as well as their drifting flies. To have the best possibility of catching fish, fluorocarbon is a must. We have found in the past year that Trout Hunter Tippet is by far the best tippet to use. Trout Hunter is strong and stretchy and helps keep you from breaking off hard fighting fish. 5.5x and 6x Trout Hunter is our favorite for the San Juan. Polarized Sunglasses – This should be a no brainer, but people still forget this fact. Polarized sunglasses help you see the fish. If you can see the fish on the San Juan, you are half way there! Plus it keeps hooks out of your eyes from wayward casts. If your glasses are polarized, they will work; HOWEVER we have found the Smith Chromapop series of lenses to be by far the best lenses we have ever fished. These lenses work in a variety of lights, especially at dusk and dawn. Accessories – You are going to want: forceps to remove flies from fish and crush barbs on hooks (the San Juan is a barbless, 2 fly max fishery), nippers (don’t use your teeth), indicators, a good assortment of split shot, fly floatant for when trout are sipping dries, drinking water, lunch, a vest or pack to carry all your gear, and sunscreen. Finally you will want a leader straightener, which will ensure your leader is straight so you are detecting the most subtle strikes when nymphing and are able to set the hook quickly without any slack in the leader. Our Juan boxes can get a little crazy, you may want to keep yours a little more simple. To expand on that, small midges and annelids are what the fish are eating. Now of course, there are more food sources than these two; however 90% of the time 90% of the fish you can catch will be on these two imitations…figure out that math! Rather than write an entomology tome that lists all species and subspecies of bug and insect that resides in waters of the San Juan tailwater along with it’s corresponding imitation; I will keep this as simple as I can with two lists: one list of the trout food most often spotted in the San Juan, and another with the flies I would use. • Midges – The staple, year round food source. • Leeches – Fish will eat leeches year round on the San Juan, especially in the fall and winter. • Trout Eggs – A great attractor point fly for your nymph rig, works year round but best in the spring and fall. • PMD – Found in the lower stretches in summer. • Caddis – Same as PMDs, most often found in the lower stretches throughout summer. 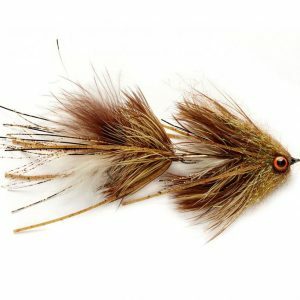 • Hoppers – Closer to the dam, trout will not target hoppers as frequently, but as you make your way down river (especially in the lower water) hoppers become a great fly of choice in the summer. • Large Flying Ants – Large ants will wash out of the cliffs above the river during the first monsoons of summer in the millions. Fish go nuts for these ants at this time, but they can be found all summer along the banks. • Baitfish – Baitfish are more productive in the lower stretches, including sculpins and fingerling trout. #14-26 – The Griffith Gnat is probably the most well-known midge dry fly. When there is large midge hatch on the San Juan River, midges clump up into little rafts and float down the river. A large Griffith Gnat works well to imitate these midge clumps. #18-24 – Flashback or standard, Pheasant Tails are one of our favorite BWO nymph imitations for the San Juan River. #8-12 – Leeches are a staple in dirty water and through winter. Buggers, Bunny Leeches, Goat Leeches, Simi-Seal Leeches, or Chamois Leeches all work great. Dead drift, jig, swing, or strip. Olive, black, blood leech, Canadian olive, white, tan, and gray. #10-16- Small black Stimi’s work great as a flying ant while larger tan, orange, and yellow work great as a hopper on the lower reaches. The Stimulator can also be used as an indicator in a dry dropper set up. Duranglers Midge Pupa, Duranglers Single Adult Midge, Duranglers San Juan Midge Adult, Duranglers San Juan Midge Emerger, Red Hot, Brassie, Disco Midge, Big Mac Midge, Jujubaetis, Jujubee Midge, Zebra Midge, Mercury Midge, Bling Midge, Thread Body Baetis, Brown Baetis Nymph, Mole Fly, Trout Crack, Biot Midge, Sproat Midge, Fluff Baetis, Scissorbill Special, Buckskin, Desert Storm, and the Miracle Nymph. Techniques to help put it all together. Completing the puzzle. Figuring it out, making it happen. Cliches aside, there are four fly fishing techniques you need to learn well for fly fishing the San Juan River. This is by far the single most important thing you need to keep in mind on the San Juan. Heck, this is the single most important fly fishing technique period. Stop changing flies. Stop moving around. Stop casting. Stop everything. Just observe and take it all in (good life advice by the way). Take 5 minutes and do nothing but stand still in the river and just watch. This will make you a better fisherman in the long run, but it will also make your day on the San Juan more successful. Did you notice any bugs on the water? Do you see any fish? (if you chill out and relax you will) Where are the fish feeding in the water column? On the surface, just under, or on the bottom? How are they feeding? Are they moving around a lot or is their mouth the only thing moving? Where is the sun? What time is it? Observing the water, bugs, and fish BEFORE you ever throw a single cast will yield more fish. Why? Because you actually have some kind of clue about what is happening and what the fish are doing. And if conditions change, or you move; take another 5 and just watch. It takes patience, and his hard to master when you feel like everyone else is catching and you are getting skunked. This might be one of the greatest secrets of fly fishing guides. While clients are busy casting to the one fish they think they saw; guides spend the entire day taking in the whole picture. Learn to relax, take a few deep breaths and observe. Oh, and once you take it all in; adjust your fly rig accordingly. Change flies, add or remove split shot, adjust your fly depth with your indicator. Be scientific about it. Make changes one at a time until start catching fish. Get these techniques dialed an you will start to locate footballs. Do you know what a drag free drift is? A drag free drift is when your flies float naturally down the river with the current; not being dragged across the current. If it isn’t drag free, then more often than not, trout will reject it. It doesn’t look natural. Fortunately most of the San Juan River is very easy flowing and forgiving when attempting to get a drag free drift, however some areas may have a few tricky currents. Hopefully you figured out the tricky currents when you sat and observed the water before making a cast. 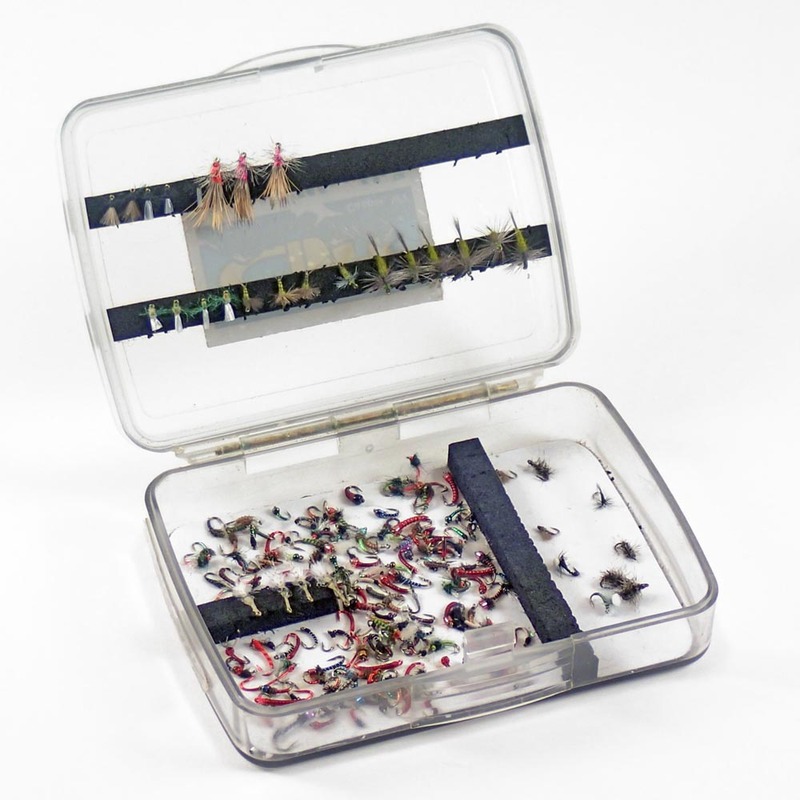 Mend your line to ensure your flies go drag free for the longest possible drift. Keep mending, it is an learned skill. Now casting a nymph rig is fairly simple for San Juan River fly fishing. Simple because you rarely have to cast more than 20 feet. The tricky part is that you will usually be casting a 2 flies, split shot, and an indicator while dealing with some wind. The secret is to open up your cast. You don’t need tight loops because you are not bombing 80 feet of line. Opening up your cast will help keep your leader untangled. Just relax and if you are unsure, just stick to a simple roll cast. Don’t try to impress anyone with your casting skills, just your catching skills! Should you get too trigger happy, you may learn a fifth skill: untangling a birds nest of midge flies and 6x tippet. 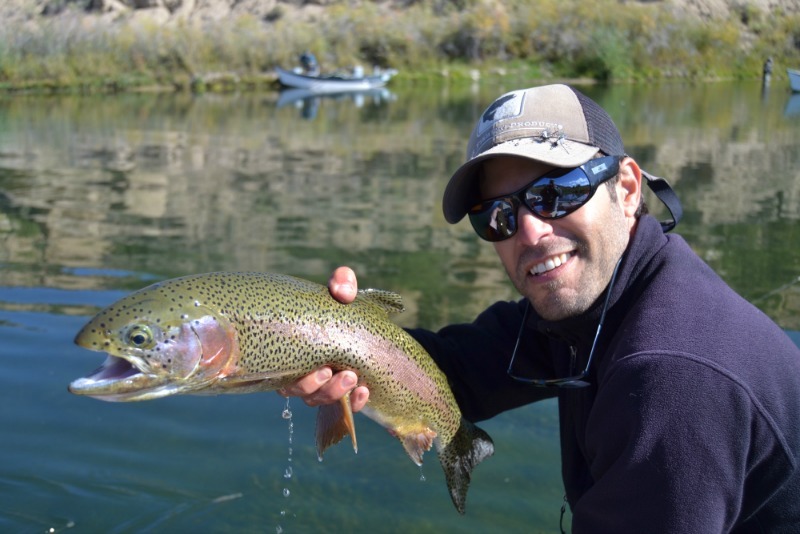 Hopefully this little primer on San Juan River fly fishing will help you on your first fishing trip to one of the greatest tailwater fisheries in the United States. Of course, there are many nuances in flies, techniques, and gear that can be taken into consideration when heading to the Juan. Unfortunately I am at about 2800 words as is and I could write another 10,000 or more words on just a few miles of one river. The best way to learn is to get out there and do it! If you are unsure where to start, let us recommend you begin either in the upper flats or around Texas Hole. We created this interactive map to help you find some of our favorite spots. Now are ready to hit the San Juan, guns blazin! Are there any good little feeder streams with easy access that have good fishing? There are lots of feeder streams with easy access that have good fishing. What area are you thinking of going? thanks for sharing the experience and the joy ! Awesome, thank you so much Sandro for the kind words! I know this is an impossible question but if you had to guess when is ice out on the river? Just a general guess is appreciated. I fished it in the Pagosa area and caught big rainbow and want to return this spring. Thanks. If you are talking about the San Juan in Pagosa, it is probably fairly ice-free. We have had a pretty mild winter and it is probably pretty open. Is a boat a necessity, just a good idea, or not really any advantage at all when fishing the San Juan? A boat offers a different experience when fishing the San Juan, but it is not necessary. Thank you! Andy – appreciate the article. Has some really good info. A group of us were looking at planning a fishing trip this summer, but wanted to know about the crowds. How are the crowds in the summer (June, July, August)? Weekdays and weekends? Typically the crowds are busiest in the summer, especially on the weekends. There is no way around it, the San Juan is a popular place especially in summer. That being said, the Summer is also the best time to be on the water with very consistent fishing and the opportunity for lots of dry fly fishing. Hope that helps, please let us know if you have any other questions! I’m thinking about giving the San Juan a whirl this fall. I am familiar with Bloomfield. Is there any decent trout fishing on the river near there, and is there access?